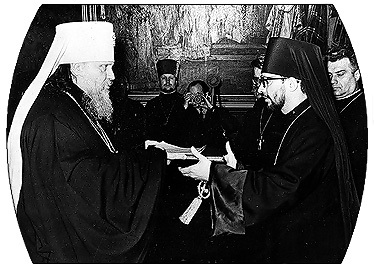 AGREEMENT made this 31st day of March, 1970; between RUSSIAN ORTHODOX CHURCH – MOSCOW PATRIARCHATE (referred to hereinafter as the “Patriarchate”), acting through its Plenipotentiary; His, Eminence Nikodim, Metropolitan of Leningrad and Novgorod, and Chairman of the Department of External Affairs of the Patriarchate, and RUSSIAN ORTHODOX GREEK CATHOLIC CHURCH OF AMERICA (referred to hereinafter as the “Metropolia”), acting through its Plenipotentiary, His Eminence, Ireney, Archbishop of New York and Metropolitan of All America and Canada. (d) possess all the rights, powers and privileges usually associated with autocephaly under the Canonical Tradition of the Eastern Orthodox Church, including the right to prepare the Holy Chrism. (1) The Patriarchate agrees that the Metropolia after its proclamation as Autocephalous Church shall have exclusive jurisdiction, both spiritual and temporal, over all the bishops, clerics, and faithful of the Eastern Orthodox faith in continental North America, including the State of Hawaii, who are now in communion with the Metropolia or who shall hereafter enter into communion with the Metropolia, and also over all the parishes which are now affiliated with the Metropolia or which hereafter may be received into affiliation with the Metropolia, excluding all clergy, all properties and parishes enumerated in Article V, paragraph (1), subparagraphs (a), (b) and (c). (2) The Patriarchate agrees that it shall not hereafter assert jurisdiction, either spiritual or temporal, over the bishops, clergy and faithful of the Eastern Orthodox faith referred to in paragraph (1) of this Article, or over the parishes referred to in said paragraph (1), and hereby cedes to the Metropolia all such jurisdiction in every respect which it now claims to possess, in that territory, excluding all clergy, properties and parishes enumerated in Article V, paragraph (1), subparagraphs (a), (b) and (c). The Patriarchate agrees forthwith to dissolve its Exarchate in North America and to recall the Patriarchal Exarch from the territory of the Metropolia as described above and not to reestablish an Exarchate in such territory at any time in the future. The Patriarchate further agrees that simultaneously with the issuance of the proclamation declaring the autocephaly of the Metropolia, as hereinafter provided, it shall issue a proclamation of His Holiness, the Patriarch of Moscow, and the Holy Synod formally declaring the dissolution of the Exarchate, and also agrees that the Patriarch shall communicate such proclamation to the Metropolitan of the Metropolia and to the heads of all other autocephalous Orthodox Churches. (a) The St. Nicholas Cathedral, together with all its property located at 15 East 97th Street in the City of New York, as the Delegation (representation) of the Moscow Patriarchate, and the residence annexed thereto, and the real property located at Pine Bush, New York, together with the buildings and improvements thereon. (b) The Parishes and clergy in the United States of America which are now affiliated with the Exarchate of the Patriarchate and which wish to remain canonically affiliated with the Patriarchate. (c) The Parishes and clergy in Canada which are now affiliated with the Diocese of Edmonton and Canada of the Moscow Patriarchate and which wish to remain affiliated with the Patriarchate. (2) The St. Nicholas Cathedral together with its property and the residence attached thereto and the real property in Pine Bush, New York, shall be administered by His Holiness the Patriarch of Moscow by means of a person in the priestly rank representing the Patriarch. (3) The Parishes and clergy presently remaining affiliated with the Patriarchate in the United States of America shall be administered by His Holiness, the Patriarch of Moscow, by means of one of his vicar bishops (not having the title of the local American Church) especially appointed to this office and until such time as these parishes will officially express their wish to join the Autocephalous Church in America, in the manner hereinafter provided. (4) The parishes and clergy constituting presently the Diocese of Edmonton and Canada of the Moscow Patriarchate and presently remaining affiliated with the Patriarchate shall be administered by His Holiness, the Patriarch of Moscow, by means of one of his vicar bishops (not having the title of the local church) especially appointed to this office until such time as these parishes will officially express their wish to join the Autocephalous Church in America in the manner hereinafter provided. (5) The Patriarchate agrees that it shall use its efforts to effect the affiliation with the Autocephalous Church in America of the clergy and the faithful of the faith who are now affiliated with the Patriarchal Exarchate and agrees not to counselor assist the affiliation of such clergy, faithful and parishes with any church of the Eastern Orthodox faith in continental North America and Hawaii except the Autocephalous Church in America. (6) After the proclamation of the autocephaly of the Metropolia the change of jurisdiction by the parishes now canonically affiliated with the Moscow Patriarchate shall be performed by the initiative of such parishes and after a bilateral agreement in each particular case between the Patriarchate and the Autocephalous Church in America. (7) The Metropolia agrees to accept into its jurisdiction upon the receipt of applications for admission, the faithful and parishes presently affiliated with the Exarchate in the manner explained in paragraph (6) of this Article provided, however, that, in the case of clerics, they are in good standing and there is no canonical bar to their admission. (8) The Metropolia further agrees to consider the admission into the Metropolia of those bishops presently under the jurisdiction of the Patriarchal Exarchate, but the decision concerning the admission of those bishops shall be at the discretion of the Metropolia. (9) The Patriarchate shall not accept into its jurisdiction in North America either clerics without canonical releases, or parishes, except parishes from uncanonical ecclesiastical bodies in Canada, and shall not issue canonical permissions either to clerics or parishes in its jurisdiction to join any Orthodox jurisdiction except the jurisdiction of the Autocephalous Orthodox Church in America. (10) The Patriarchate agrees to see to it that the provisions of its Statute concerning those parishes which shall remain under the jurisdiction of the Patriarchate conform to canonical norms governing the Statute of the Metropolia. (11) The Patriarchate assures the parishes who wish to stay under its authority of its readiness to defend their status as parishes of the Patriarchate and also to defend those parishes from attempts to change their present status without their own free decision and without a written consent of the Patriarchate. (12) Each of the Churches – the Moscow Patriarchate and the Orthodox Church in America – pledge not to undertake any actions or efforts directed at an intervention into the internal affairs of the other church or its parishes and each also pledges not to make any efforts to change the jurisdictional status of parishes under the authority of the other agreeing party. Clergy and parishes of each of the agreeing parties shall abide in peace and concord with one another. The Patriarchate agrees that the Metropolia after the proclamation of its autocephaly shall have exclusive jurisdiction over all property, real and personal, tangible and intangible, in continental North America and Hawaii which is now owned either by the Metropolia or by any corporation or other organization supervised or controlled by or in connection with the Metropolia (except all that which is enumerated in Article V, paragraph (1) except parishes affiliated with the Metropolia, the jurisdiction and ownership of whose property is dealt with in Article VII hereof. The Patriarchate further agrees that it will not directly or indirectly at any time or in any way contest or otherwise interfere with such jurisdiction of the Metropolia or such ownership by either the Metropolia or the affiliated corporations or organizations mentioned in this Article, with the exception of all that which is mentioned in Article V, paragraph (1) of this agreement. In the same manner the Metropolia in its own name and in the name of corporations and Organizations governed or controlled by it renounces all claims to all that which is comprised in Article V, paragraph (1) and which is in the jurisdiction and at the disposal of the Patriarchate. (d) cooperate with any of such parishes either in a disaffiliation or attempted disaffiliation from the Metropolia or in an affiliation or attempted affiliation with any church other than the Autocephalous Church in America. The Metropolia hereby states that it intends subsequent to the effective date of this agreement to effect the legal change of its present name to “Orthodox Church in America,” or some similar name which may be decided upon by its All American Sobor, and the Patriarchate acknowledges this statement of intention by the Metropolia. The Metropolia hereby states that the present Statute of the Metropolia shall continue to be its governing Statute after the declaration of its autocephaly, as herein provided, until such Statute may be amended in whole or in part by the All American Sobor of the Metropolia. Recognizing the jurisdiction of the Moscow Patriarchate as a lawful and canonical jurisdiction over the Orthodox Church in Japan, the parties agree that the Orthodox Church in Japan shall be granted autonomy, upon its petition, by the Moscow Patriarchate. The parties agree that neither of them now possesses or claims to have exclusive jurisdiction of the Orthodox faith in the continent of South and Central America where the canonical status quo is preserved. The proclamation of the autocephaly of the Metropolia by His Holiness, the Patriarch of Moscow, and the Holy Synod shall declare the Metropolia to be an autocephalous church of the Orthodox faith, having exclusive spiritual and temporal jurisdiction on the continent of North America and Hawaii with the exceptions mentioned in Article V, paragraph (1) of the present agreement and possessing all of the rights, powers and privileges usually associated with autocephaly under the Canonical Tradition of the Eastern Orthodox Church. (1) This agreement shall be executed in duplicate counterparts in the man her hereinafter provided. (2) One counterpart of the agreement shall be submitted to His Holiness, the Patriarch of Moscow, and the Holy Synod. (3) The other copy of the agreement shall be submitted to the Bishops Sobor for ratification with the understanding that the subsequent procedure set forth hereinafter in this Article will be consummated. (4) After such ratification, the Metropolitan of the Metropolia shall address a petition to His Holiness, the Patriarch of Moscow, and the Holy Synod asking them to proclaim the autocephaly of the Metropolia and to take the steps enumerated in paragraphs (5) to (8) below. (5) After the receipt of such petition, the Holy Synod of the Patriarchate shall ratify this agreement. (6) After such ratification, His Holiness, the Patriarch of Moscow, and the Holy Synod shall issue a proclamation of autocephaly in conformity with the provisions of Article XII hereof, and shall send a notice thereof to the Metropolia. (7) After the issuance of such proclamation, His Holiness, the Patriarch of Moscow, and the Holy Synod shall transmit to the Metropolitan of the Metropolia a Synodal Tome, containing the ratification of this agreement and the proclamation granting the autocephaly of the Metropolia. (8) Simultaneously, His Holiness, the Patriarch of Moscow, and the Holy Synod shall address to the heads of all other autocephalous churches of the Orthodox faith a communication advising them of the declaration of the autocephaly of the Metropolia and urging their brotherly communion with the new autocephalous church. (9) If the notice mentioned in paragraph (6) of this Article has not been received by the Metropolia within 100 days after the date of this agreement, this agreement shall thereupon become null and void and of no further force and effect unless prior to the end of this period it is extended by mutual written agreement. In the event that this agreement shall become null and void and of no further force and effect for any cause whatever, the parties agree that they shall respectively remain in the status which each enjoyed prior to the execution of this agreement. No attempted modifications of this agreement or of any of the provisions hereof shall be valid or binding on either party hereto unless in writing signed by such party, or shall be effective except in the specific instance and for the purpose for which given. This agreement has been executed in duplicate in the Russian language, the agreed upon English translation being appended to the original, the parties agreeing that the Russian text is authentic and that each executed duplicate signed by both parties shall have the full force and effect of the original for all purposes. The present agreement is subject to unconditional observance by both parties. It shall remain equally binding upon the Moscow Patriarchate and upon the Russian Orthodox Greek Catholic Church in America after the proclamation of its autocephaly. IN WITNESS WHEREOF, the parties have signed this agreement by their respective Plenipotentiaries described above in the City of New York, State of New York, United States of America, on the day and year first above written.